If you’re looking for state of the art caulking tools, you’ve come to the right place. Founded in 1974, OX Tools have introduced a huge range of dependable and robust hand-held tools to the Australian market. This includes their caulk application tool, which is a well-designed piece of kit, capable of fulfilling all your caulking requirements. This heavy-duty sealant gun is truly second-to-none and can help you easily seal any cracks or gaps (or perform any other sealing related duties). 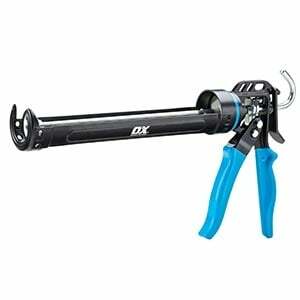 Caulking guns are well respected pieces of kit, and OX’s offering is no exception. With plastic bushing to reduce sealant gun squeak, and dipped handles for the best grip, you can’t go far wrong with this ultimate sealant applicator. As cordless caulking guns go, it truly stands out as an exceptional and easy to use model, with high thrust trigger action and adjustable screws. No matter what you need it for, you won’t find a better sealant tool on the market. Whether it’s for the OX Tools OX-P044440 Pro Heavy Duty Sealant Gun or any other product you’re after, SGS offer quality customer care and plenty of benefits when you shop with us. With free next day delivery option, as well as a handy 60 day returns policy, be sure to shop at SGS today and we guarantee you won’t be disappointed.